Well it is Spring again, and my allergies are worse than ever!! How is that possible? I left Iowa hoping to leave my allergies behind, but that is apparently not how it works. I guess I didn’t do enough research on the pollen counts in Phoenix, because they are off the charts. The last thing that I want to do while living in a Sudafed induced fog, is cook. I can barely think straight, so playing with sharp knives or remembering to turn things off becomes a major chore. That is where Simple Chicken Enchiladas Verdes comes in….. When I was wondering around the grocery store a few weeks ago looking for ideas to incorporate into my Instant Pot Salsa Verde Shredded Chicken, I came across this Green Chile Enchilada Sauce…..
and I was intrigued. There must be something I can make with it, right? Fast forward to this week, and I was chosen to complete two upcoming sponsored posts for Cinco de Mayo…and the creative juices started flowing. My son’s girlfriend Kristin and I were tossing ideas back and forth for those two posts, and then I seriously started craving Mexican food!! Time to get creative with this enchilada sauce. 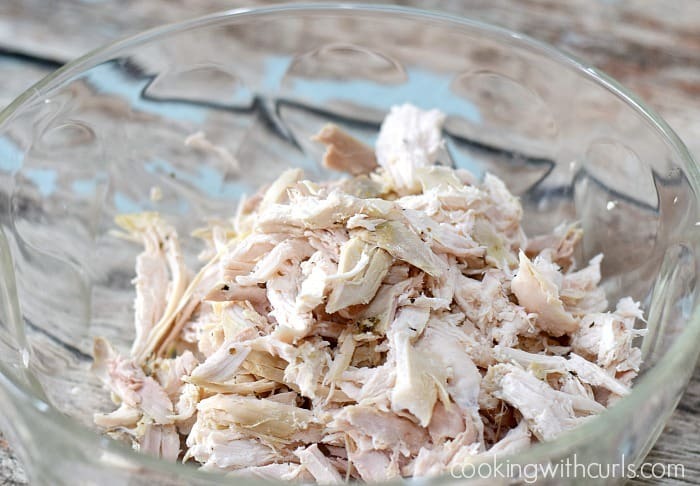 I had a rotisserie chicken, a container of Fage Greek yogurt, and flour tortillas for the upcoming recipe…yep, I’m gonna use them to create Simple Chicken Enchiladas Verdes…..
Preheat oven to 400 degrees. 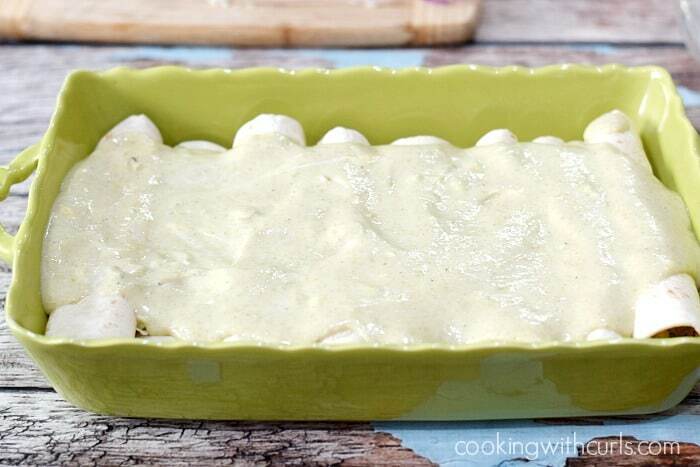 Grease or butter a 9 x 13 inch baking dish, set aside. Combine the green enchilada sauce and yogurt/sour cream together in a bowl. 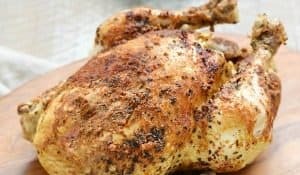 Cook and shred some chicken breasts, or tear apart a rotisserie chicken….. 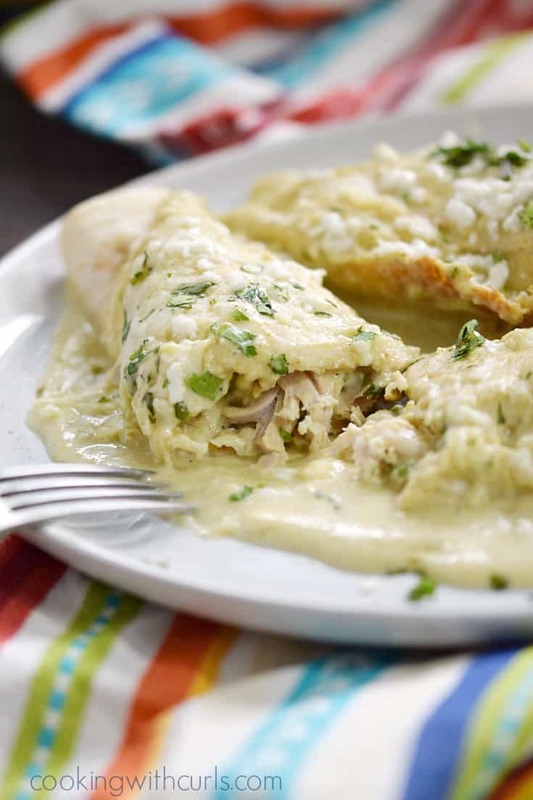 Mix the chicken, 1 cup of sauce mixture, 1/4 cup of cilantro, and 1 1/2 cups of cheese together in a separate bowl…..
Pour 1 cup of enchilada sauce in the baking dish and spread around to cover…..
Scoop 1 cup of chicken mixture and place it in the center of a tortilla….. Fold and wrap the tortilla around the chicken mixture and place seam side down in the baking dish. Continue with the remaining tortillas. 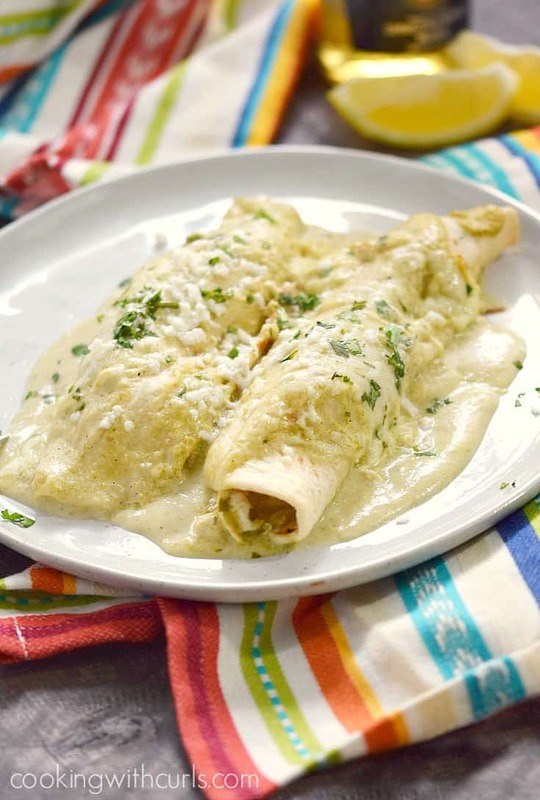 Pour 1 1/2 cups of the enchilada sauce over the top of the filled enchiladas…..
Sprinkle the remaining cheese over the top of the sauce…..
Cover with foil and bake for 20 to 30 minutes, until the sauce is hot and bubbling. Remove and set aside to set for a few minutes. Garnish with crumbled or shredded Queso Fresco and remaining cilantro….. Serve with remaining enchilada sauce and toppings of your choice, guacamole, tomatoes, etc. 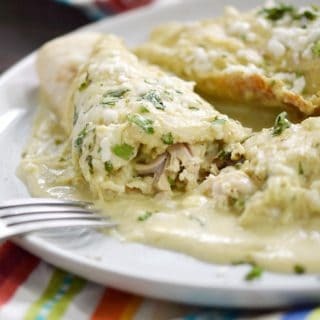 I poured some of the sauce on the plate, then topped it with these hot and delicious, Simple Chicken Enchiladas Verdes. OMG…so yummy!! 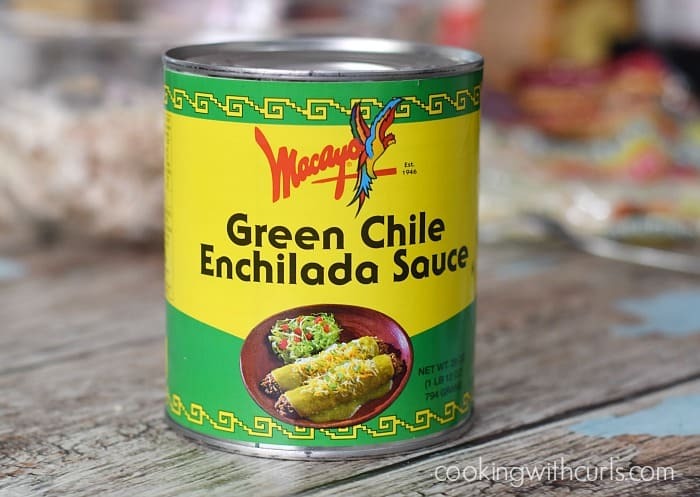 I chose that particular brand of green chile enchilada sauce because it was the only one that did not contain MSG, or any other strange ingredients. Unfortunately for me, it is quite spicy so I added the yogurt to cool it down….and drank lots of water. You can use corn tortillas, but you will need to soften them in hot oil or the microwave to make them pliable. You will also need twice as many. My tortillas were fresh, and soft so I did not need to soften them first. 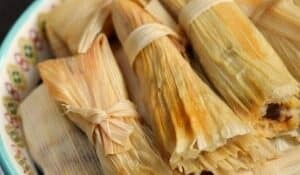 You can always roll them in plastic wrap and heat them in the microwave for 15 to 20 seconds. I used queso fresco for added flavor and color. Queso Cojito and Queso Blanco would be good choices as well. If you like super spicy, substitute Pepper Jack cheese for the Monterrey Jack. 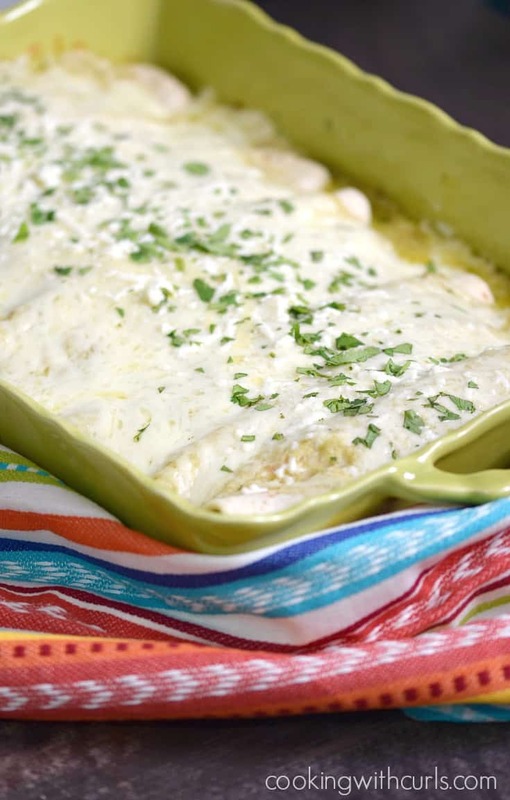 These Simple Chicken Enchiladas Verdes are crazy delicious and couldn't be any easier to prepare. They are guaranteed to become a family favorite! 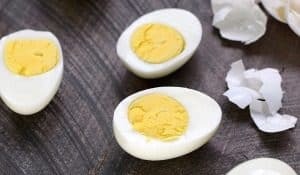 Combine the green enchilada sauce and yogurt/sour cream together in a bowl. 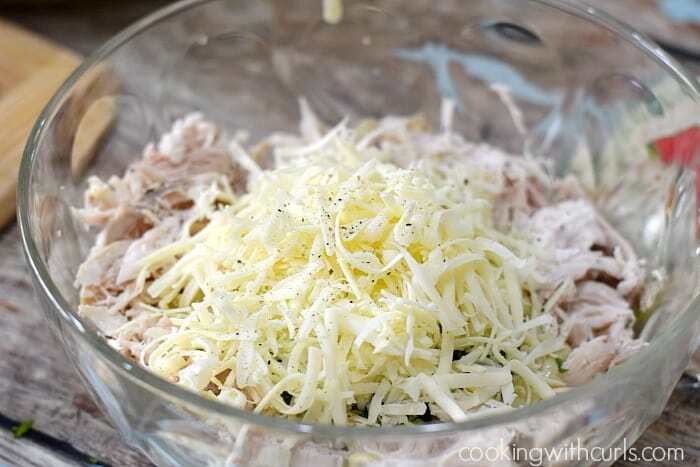 Mix the chicken, 1 cup of sauce mixture, 1/4 cup of cilantro, and 1 1/2 cups of cheese together in a separate bowl. 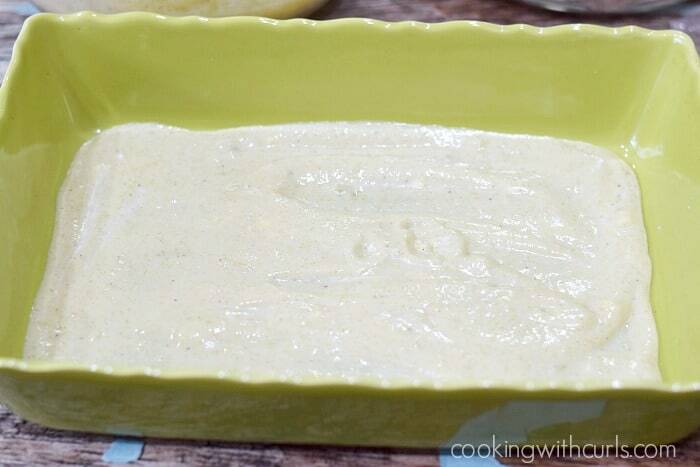 Pour 1 cup of enchilada sauce in the baking dish and spread around to cover. 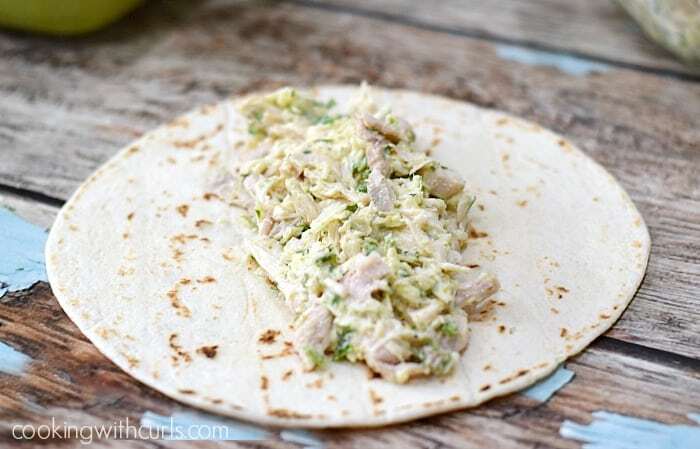 Scoop 1 cup of chicken mixture and place it in the center of a tortilla. Pour 1 1/2 cups of the enchilada sauce over the top of the filled enchiladas. Sprinkle the remaining cheese over the top of the sauce. Cover with foil and bake for 20 to 30 minutes, until the sauce is hot and bubbling. Remove and set aside to set for a few minutes. Garnish with crumbled Queso Fresco and remaining cilantro. Serve with remaining enchilada sauce and toppings of your choice, guacamole, tomatoes, etc. Nutrition Facts are just guidelines. Using different ingredients and brands will alter the calculations. That looks so good to me. Love anything baked in cheese, but I like the “light” look of this. Great to prepare for a crowd because you could have these made and set and waiting to pop in the oven. Pinning! Anything Mexican appeals to me! 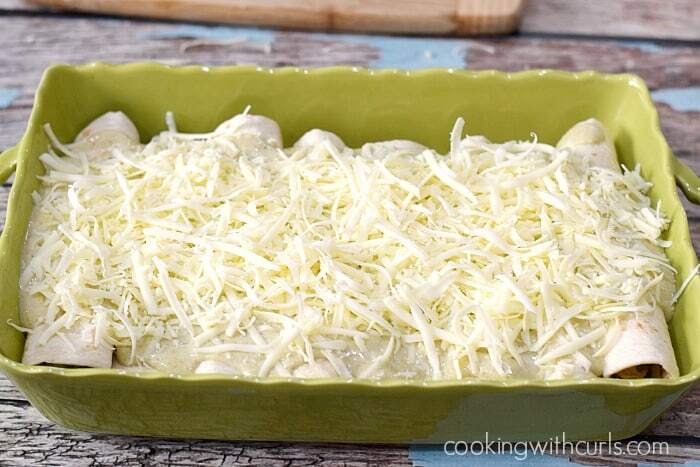 I’d love to try these enchiladas – pinning for future reference! Thanks for sharing at Best of the Weekend!